This impressed mark is recorded on the following figures. On some busts, the mark is poorly struck because of the curvature of the socle. "Burslem" is sometimes omitted, and mark may read as "R Wood" rather than "Ra Wood". Lost Sheep. Same as the figure model that occurs impressed 9. Courtesy Roger de Ville. Bust of Milton impressed with both the Ra Wood Burslem mark and 82. I have another in my archiveon a marbled socle and with the Wood mark but not the number, Also, an unpainted bust marked and impressed "81." Bust of Handel impressed "Ra Wood 80." Courtesy the Burnap Collection. This bust of Zingara is also impressed EGYTPIAN PRIESTESS. Same as the model that occurs impressed 92. Private collection. Formerly sold at Bonhams Knightsbridge, May 11 2005, lot 88. Hercules. Same as the figure model that occurs impressed 103. Courtesy Jonathan Horne, Exhibition Catalogue XIII, 380. Same as the figure models that occur impressed 131 and 132. Private collection. Formerly at Bonhams, May 18, 2011. Newton. Same as the figure model that occurs impressed 137. Courtesy the Willett Collection. Chaucer. Same as the figure model that occurs impressed 137. Courtesy the Fitzwilliam Museum. Same as the figure model that occurs impressed 169. Courtesy Bonhams, May 18, 2011, lot 121. In addition, the following enamel-painted figures with this mark are recorded. Small bust of Milton (as 127, not as 81. Height 8-3/4"). Christie's S. Ken, Oct. 20 1992, lot 334. Rural Pastime group with the man on the left (like the group impressed 166, see section 2, below). This mark is impressed into the back of the base of each of these figures. 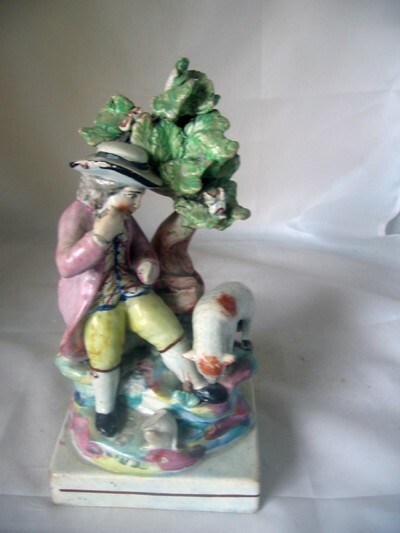 Each figure has other Ralph Wood characteristics that are essential for attribution because the "W" mark was not exclusive to Ralph Wood and appears on an Enoch Wood shard at the Potteries Museum and on figures that were probably made by Enoch Wood. Lost peice [sic] found. Same as the figure model that occurs impressed 10. Courtesy Aurea Carter. Fortune. Same as the figure model that occurs impressed 169. Sold on eBay. Another--or perhaps this very one--sold at Christies South Ken, April 3 1997, lot 30. Same as the figure model that occurs impressed 131 or 134. Same as the figure model that occurs impressed 153. Private collection, Myrna's archive record. Chaucer. Same as the figure model that occurs impressed 137. Sold at Brettells Auctions. Sold on eBay July 2012. No example of this figure with an impressed number is recorded. No example of this figure with an impressed number is recorded. Each of the figures in the block below has an impressed number. In each case, my records (usually a photo) support the number. So what do the black blocks mean? These are placeholders for figures that I have not been able to photograph. In most cases, the figures are recorded in older literature. Hold your mouse over the block to view summary details. Please remember we also know of most of these figures from unnumbered look-alikes. You can see them in my books. 1 Gardener. Courtesy The Potteries Museum. 2 Mate. Courtesy The Potteries Museum. 4 & Partner. Courtesy Bonhams. 5 Clown. Recorded on the list in Halfpenny. 6 Clown. Courtesy Aurea Carter. Male Gardener. Probably like figure 9. Recorded in Falkner. 9 & Mate. Like the previous figure impressed 8. Courtesy The Potteries Museum. 9 Lost Sheep Found. Courtesy Aurea Carter. 10. Lost Piece Found. Courtesy Martyn Edgell. 19 Reclining Hind. Recorded in Falkner. 20 Oliver Cromwell. Courtesy Jonathan Horne, see Exhibition Catalogue IV. 21 Bag Piper. Courtesy The Potteries Museum. 21 Venus and Cupid. Recorded in Falkner. 22 Neptune. Recorded in Falkner. 23 St. George and Dragon. Recorded in Falkner. 28 King David. Courtesy the Victoria and Albert Museum. 29 King David. Courtesy The Potteries Museum. 30 Mower. Porcelainous body. Courtesy Roger de Ville. 31 Hay maker. Like the Hay maker impressed 33, and with a different head from that on the following hay maker, also impressed 31. 31 Hay Maker. Note that this figure has a different head from the previous and following hay makers. Courtesy The Potteries Museum. 33 Hay maker. Like the figure impressed 31. Courtesy Elinor Penna. 33 Bull baiting. Recorded in Falkner. 36 Gamekeeper. Grigsby in "Passion for Pottery" notes this figure in the Colonial Williamsburg Collection. 37 Van Tromp. Like the following figure but numbered differently. Courtesy Elinor Penna. 38 Van Tromp. Like the previous figure but numbered differently. Courtesy The Potteries Museum. 41 Hudibras. Like the following figure but numbered differently. Courtesy The Potteries Museum. 42 Hudibras. Like the previous figure but numbered differently. Courtesty Wisbech and Fenland Museum. 43 Dr Franklin. Courtesy the New York Historical Society. 48 & Lady. 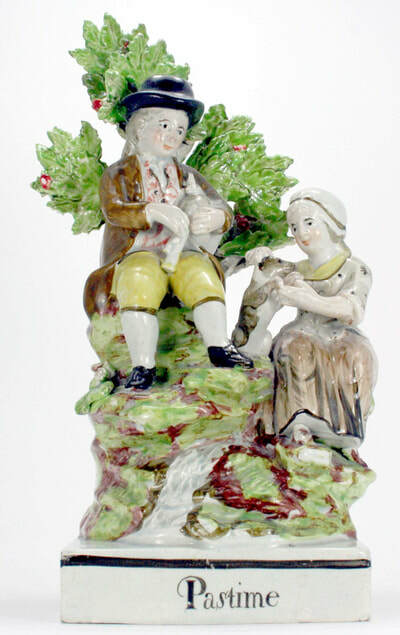 Pairs with sportsman, but a numbered enamel-painted example of that figure is not yet recorded. Courtesy Aurea Carter. 49. Fruit Boy. Recorded in Falkner. Dutch Boy. Courtesy Neil Miller. 52 Venus holding a bird. Sold at Christie's South Ken on October 29 1992, lot 384. 53 Minerva. Also shown impressed 59. Courtesy The Potteries Museum. 55 Old Age. Recorded in Falkner. 59 Minerva. Also shown impressed 53. 62 Vicar and Moses. Recorded in Falkner. 63 Vicar and Moses. Far more common in colored glazes. I struggled to track down this example, which is in poor condition. 65 Gasconian. Courtesy The Potteries Museum. 66 A Gasconian. This figure is impressed beneath the base and the number could be read as 99. 67 Gasconian. Recorded on the list in Halfpenny. 67 Girl with a pitcher on her head. Recorded in Falkner and is probably the figure sometimes found titled A Galego. 68 Gasconian. This figure is in either the Potteries Museum or Brighton and Hove Museums. 68 Peasant Worshiping. Courtesy The Potteries Museum. 69 Worshiper. Courtesy The Potteries Museum. 70 Worshiper. Courtesy the Brighton and Hove Museums. 71 Spanish Dancer, male, and 73 Spanish Dancer, female. 72 Spanish Dancer, female. Courtesy Aurea Carter. 74 Sweep Boy. Recorded in Falkner and probably like figures 5 and 6. 78. Jupiter with eagle to the left. Courtesy Bonhams. 79 Jupiter with eagle to the left. Courtesy the Fitzwilliam Museum, Cambridge. 80 Bust of Handel impressed "Ra Wood 80". Burnap Collection #548. 81 Bust of Milton. This is the bigger bust of Milton, like no. 82. Note the smaller bust, no. 127. The Rev. George Whitefield. Courtesy Aurea Carter. 88 Shepherd musicians. Porcelainous body. Courtesy the Geoffrey Godden Collection, The Potteries Museum. 89 Couple with birdcage. Bocage restored. 90 Couple with bird cage. Courtesy Christie's NY. 92 Zingara (impressed on reverse). Courtesy the Victoria and Albert Museum. 96 Iphigenia. Recorded on the list in Halfpenny and like no. 136. 96 Boy, arms folded. Possible like Cymon, no 135. Recorded in Falkner. 96 Iphigenia. As no 136. Recorded in Halfpenny p133. 99 Gasconian. Almost certainly intended to be read as 66! Courtesy Aurea Carter. 112 Shakespeare. Courtesy the Victoria and Albert Museum. 117 St. Peter. Courtesy Green Valley Auctions. 117 St Petrus. Courtesy Christie's. St Peter. As figure no. 117. Recorded in Falkner. 119 St Phillip. Courtesy Brighton and Hove Museums. 119 St John. Recorded in Falkner. 120 St. Paul. Courtesy Green Valley Auctions. 121 St Phlilip. Probably the same as the figure of St Phillip impressed 119. Recorded in Falkner. 122 St. Andrew. Courtesy The Potteries Museum. 123 Bust of Voltaire. Recorded in Falkner. 127. Small bust of Milton. This is probably the same as the following bust impressed 128. Recorded in Falkner. 128. Bust of a gentleman, probably Milton. Differs from the bust of Milton impressed 82. Courtesy Robert Hawker. 131 Scuffle. Like the group impressed 134. The Potteries Museum. 131 Flemish Music. Courtesy John Howard. 133 Contest. Porcelainous body. Also recorded with conventional earthenware body. The Potteries Museum. 134 Scuffle. Courtesy Bardith, NY. 134. Porcelainous body. Same as no. 154. 135 Falconer. Image from Halfpenny & Beddoe, "Circus & Sport." 135 Cymon. Recorded in Falkner. 136 Iphignia. Recorded in Falkner and like figure no. 96. 137 Chaucer. Impressed with both the number and the Ra Wood Burslem mark. Courtesy Roger de Ville. Newton. Courtesy the Willett Collection, Brighton & Hove Museums. 140 VIrgin Mary. Porcelainous body but also recorded numbered with earthenware body. Courtesy the Godden Reference Collection, The Potteries Musuem. 150 Goat with kid. Bocage restored. 152 St Andrew. Probably as 122. Sotheby's NY, 25 October 1991, lot 244. 153 Tenderness. Bocage lost. Porcelainous body. 154. Friendship. As no. 134. Bocage lost. Courtesy the Goodacre Collection. 155 Chaucer. As no. 137. 163 Shepherd and shepherdess spill vase. 164 Boy bird nesting spill vase. 169 Fortune. The mural crown here is restored and should be shorter. Courtesy Madelena. Data on Ralph Wood's color-glazed figures will be posted here in due course.